The ERCO Ercoupe is a low wing monoplane first manufactured by the Engineering and Research Corporation (or ERCO) shortly before World War II. It was designed to be the safest fixed-wing aircraft that aerospace engineering could provide at the time, and the type still enjoys a very faithful following today. In late 1931, aeronautical engineer Fred Weick was the assistant chief of the aeronautics division of the National Advisory Committee for Aeronautics (NACA). A group of co-workers and he designed and assembled an experimental aircraft in 1934 with a group of his colleagues. Responding to a Bureau of Air Commerce sponsored design competition to build an easy-to-fly, safe aircraft, Weick and his friends worked on the project in their spare time and paid for it themselves. 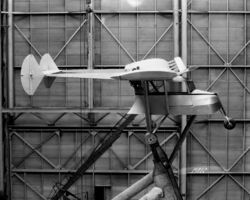 The test aircraft built by Weick, known as the W-1, featured tricycle landing gear, a high parasol wing, and a pusher propeller configuration. The single engine was used for economy of operation and the tricycle gear was intended to prevent “nose over” landing accidents where the aircraft would flip over on its nose. Weick's design was influenced by the Stout Skycar as well as NACA research, which was first incorporated in the Hammond Y aircraft of 1934. Weick left NACA in 1936 and joined ERCO's fledgling aircraft team as chief designer, primarily to continue improving his aircraft design. Focusing his efforts on a number of design issues, primarily simplicity and safety, Weick strove to create a reasonably priced aircraft that would not stall or spin. Retaining the tricycle gear (for ease of maneuvering on the ground), Weick switched to a low-wing monoplane configuration in his improved model, powered by a tractor propeller configuration. The refined W-1A (originally known as the ERCO 310), which included a fully cowled engine, made its first flight in October 1937 and was soon renamed the “Ercoupe.” The twin-tail Ercoupe became an instant sensation because of its easy-to-fly design and unique design features, including a bubble canopy for great visibility. Lacking rudder pedals, the Ercoupe was flown entirely using only a control wheel: a two-control system linked the rudder and aileron systems, which controlled yaw and roll, with the steerable nose wheel. This wheel controlled the pitch and the steering of the aircraft, both on the ground and in the air, simplifying control and coordinated turning and eliminating the need for rudder pedals. A completely new category of pilot's license had to be created for Ercoupe pilots who had never used a rudder pedal. First production ERCO Ercoupe, N15692. The Ercoupe contained many innovative design features that produced an aircraft that was safe, easy to fly, and certified by the Civil Aeronautics Administration (CAA) as "characteristically incapable of spinning." The aircraft was designed by Fred E. Weick, a noted aeronautical engineer, who before coming to ERCO in 1936, worked for the National Advisory Committee for Aeronautics (NACA). The first experimental model of the Ercoupe was test flown at College Park airport in 1937. Construction of the production prototype was completed in 1939 and certification by the CAA was completed in 1940. The first Ercoupe, serial no. 1, was owned by George Brinckerhoff and flown at College Park Airport, and now belongs to the National Air and Space Museum. The two-seat ERCO Ercoupe 415 went on sale in 1940 but only 112 were delivered before World War II intervened, halting all civil aircraft production. By mid-1941, aluminum supplies were being diverted to war-related production, so ERCO decided to manufacture Ercoupes for military use by using wood as the principal building material. The substitution of wood resulted in a heavier Ercoupe, but the aircraft flew much more quietly because the wood absorbed vibrations from the engine and air flow. Ercoupes were flown during the war by the Civilian Pilot Training Program for flight instruction, and the Civil Air Patrol used them to patrol for German submarines. Take-off of America's first "rocket-assisted" fixed-wing aircraft, an Ercoupe fitted with a GALCIT developed solid propellent JATO booster with a thrust of 28 pounds force (125 N). 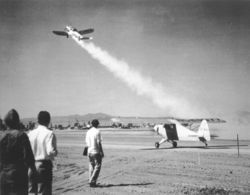 The Ercoupe took off from March Field, California and was piloted by Captain Homer A. Boushey Jr.
On August 12, 1941, the first Air Corps rocket-assist takeoff was made by a Wright Field test pilot, Capt. Homer Boushey, using a small civilian-type Ercoupe aircraft. Subsequent refinements of this technique were made for assisting heavily-loaded aircraft in taking off from limited space. This technique is still used whenever needed. By April 1949, advertising was reduced to 1/9th page. ERCO sold its remaining Ercoupe inventory to Sanders Aviation in 1947, which continued to produce the aircraft in the same ERCO-owned factory. A total of 213 aircraft were sold by 1950. Another aircraft produced by Alon (although only a single example was ever built) was the A4. The A4 was a low wing 4 place monoplane of aluminum construction powered by a single 150hp Lycoming engine. By accounts, it was a promising aircraft, but it did not go into production before Alon closed. Production of the A2 ceased in September of 1967, and on October 9, 1967, Alon was purchased by, and became a division of the Mooney Aircraft Company of Kerrville, Texas. "1968, Mooney now produced the twin tail Alon Aicoupe A2 as the Mooney A2-A. The factory moved to Kerrville, TX, late in 1968. There they re-designed the fuselage from the cockpit back. Now, the Mooney A2-A could be recognized by the square windows behind the sliding canopy. Even as they produced the A2-A Cadet, the Mooney engineers were busy re-designing the coupe into something uniquely Mooney and completely un-weick-like. The type certificate was sold again (and as of 2006, for the final time) to Univair Aircraft Corporation of Aurora, Colorado in October, 1974. 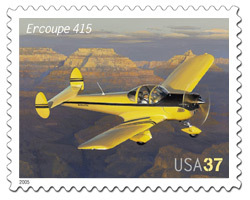 On July 30, 2005, the United States Postal Service released a stamp with an image of the Ercoupe 415 as part of its' American Advances in Aviation series. Although no new Ercoupes have been produced since 1970, many spare parts are still available. Univair has owned the type certificate since 1974 for all Ercoupe models, and continues to produce parts as well as provide techinical assistance to Ercoupe owners. Ercoupe owners also enjoy an active type club that helps to organize and efficiently distribute updated information about their aircraft. Renewed interest in the older models of the Ercoupe, the 415-C and the 415-CD, has been sparked by its status as the only existing, certified tricycle-geared aircraft that meets the FAA's new light-sport aircraft definition. This enables it to be piloted by holders of a sport pilot certificate. ↑ Ercoupe 415-C Specifications. EEA Aviation Center. Retrieved on 2007-01-18. ↑ FAA A-718.pdf Aircraft Specification No. A-718 (PDF). Federal Aviation Administration. ↑ Colby, Douglas; Corban, Bud; Cox, Bill (April 2005). "Flying for Peanuts". Plane & Pilot. Retrieved on 2007-01-18. ↑ The Ercoupe is a "warbird". ↑ Rato. National Museum of the United States Air Force. ↑ 1949 Ercoupe 415-G. Plane & Pilot. Retrieved on 2007-01-18. ↑ 7.0 7.1 FAA A-787.pdf Type Certificate Data Sheet Number A-787 (PDF). Federal Aviation Administration. Buffardi, Louis N. (1980). Ercoupe. Akron, OH: ESSCO. Thomas, Stanley G. (1991). The Ercoupe. Blue Ridge Summit, PA: TAB Aero. ISBN 0-8306-7016-5. Weick, Fred E. and Hansen, James R. (1988). From the Ground Up. Washington D.C.: Smithsonian Institution Press. ISBN 0-87474-950-6. This page was last edited on 6 March 2007, at 04:16.